With over 15 years of experience in banking and finance, Vicky has spent the last 6 years working directly with individuals and business owners to develop and implement personalized, comprehensive strategies to realize their unique financial goals. Having successfully completed the intensive education and Board examination requirements for the Certified Financial Planner™ designation: Vicky utilizes her knowledge and experience to help clients with comprehensive financial planning that may include: creating a retirement savings or income plan; funding children’s or grandchildren’s education; managing assets for appropriate return and risk management; addressing estate planning and wealth transfer considerations; protecting against the various risks to financial security; and assisting clients when making important financial decisions during times of transition such as divorce, death, retirement or other significant life changes. 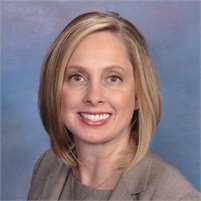 Vicky also advises small business owners in areas such as employee benefits, retirement plans and succession planning. Vicky received her Bachelor of Science degree from Ball State University and went on to obtain a Master of Arts degree in Organizational Communication. Originally from Indiana, Vicky has lived in the New Orleans area with her husband, a local from Metairie, and their two children since 2000. She is proud to be part of this great community and call New Orleans home. Vicky is a member of the Women’s Professional Council of New Orleans, the Junior League of New Orleans and supports several other community service organizations and projects.